When I started playing blues songs for my first grade students, I never imagined I was introducing a fantastic launching point for thematic, standards-based teaching. 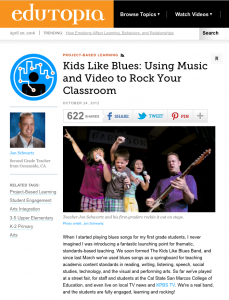 We soon formed The Kids Like Blues Band, and since last March we’ve used blues songs as a springboard for teaching academic content standards in reading, writing, listening, speech, social studies, technology, and the visual and performing arts. So far we’ve played at a street fair, for staff and students at the Cal State San Marcos College of Education, and even live on local TV news and KPBS TV. We’re a real band, and the students are fully engaged, learning and rocking! Read full article at Edutopia.